WINSTON-SALEM, N.C. (Sept. 21, 2017) – After a rigorous review process, the Childress Institute for Pediatric Trauma has selected Dr. Vincent Duron’s research project to receive a $100,000 grant based on its overall impact to enhance standard pediatric trauma care practices by studying the effects of restricted fluid management on seriously injured children. 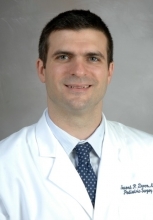 Dr. Duron is the Director of Pediatric Surgical Critical Care at New York-Presbyterian Morgan Stanley Children’s Hospital at Columbia University Medical Center. The project is titled “Effect of Restricted Fluid Management Strategy on Outcomes in Critically Ill Pediatric Trauma Patients: A Multicenter Randomized Controlled Trial.” The expected outcome is that once proved, the simple management strategy could be shared with providers in smaller or more rural hospitals to become the new standard of care of pediatric trauma patients. Drs. Katherine Biagas and Steven Stylianos, both of NewYork-Presbyterian Morgan Stanley Children’s Hospital, will be co-investigators on the study. In early 2017, the Childress Institute announced the availability of research funds for a project focused on improving treatment for pediatric trauma patients. Previous grants were awarded to pediatric trauma leaders Dr. Frederick Rivara at the University of Washington in Seattle and Dr. Lawrence Cook at the University of Utah School of Medicine. For more information please visit https://saveinjuredkids.org, or on social media at https://www.facebook.com/SaveInjuredKids or Twitter @injuredkids. Life threatening injury is the No. 1 killer of kids in America. Nearly 10,000 children lose their lives every year from serious injuries. In addition, almost 300,000 children are hospitalized and over 8 million children are treated in the emergency department for serious injuries each year, many of whom struggle with long-term recoveries and disabilities. It can happen anywhere, at any time, to any child. The Childress Institute for Pediatric Trauma discovers and shares the best ways to prevent and treat severe injuries in children. The Institute funds research, education and advocacy to help improve the care and treatment injured kids receive across the U.S. The Childress Institute was founded at Wake Forest Baptist Medical Center in 2008 through a generous gift from Richard and Judy Childress. Visit www.SaveInjuredKids.org to learn more.